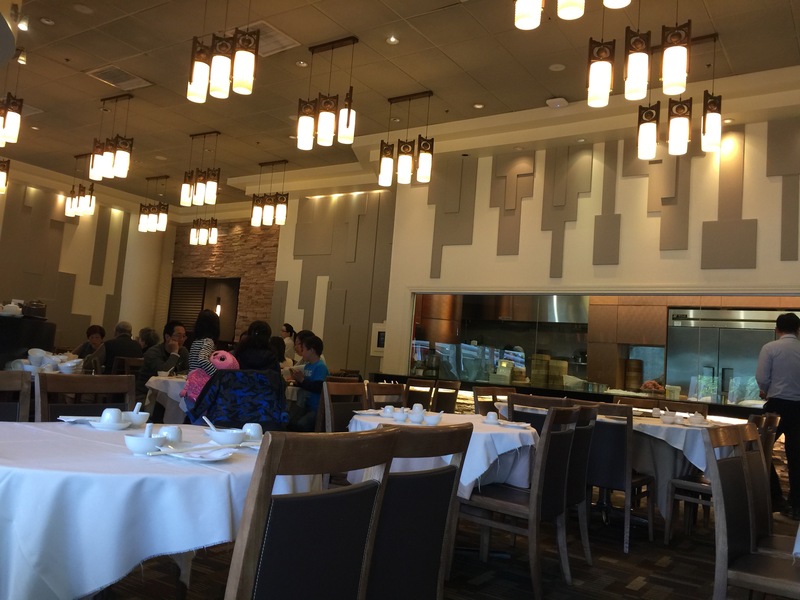 At the end of our Vancouver weekend getaway, we changed hotels from our Vancouver harbor downtown hotel to an airport hotel in Richmond, British Columbia as we had an early Monday morning flight back to Los Angeles. Richmond, which is where the Vancouver airport is located, but also the 4th largest city in the province of British Columbia is known for its ethnic diversity. In fact, 60% of Richmond’s population is made up of immigrants, with 50% of its population identifying itself as Chinese. This makes Richmond North America’s city with the largest population of Asians. Seeing the city’s demographics, my husband knew right away that he wanted our final meal of our weekend getaway trip to be Chinese food. Once we got to our hotel in the afternoon, we did some research on nearby Chinese restaurants that we could get ourselves to. It turns out that there was a very good Chinese restaurant just down the street from our hotel a couple of blocks, so we decided to check that out. 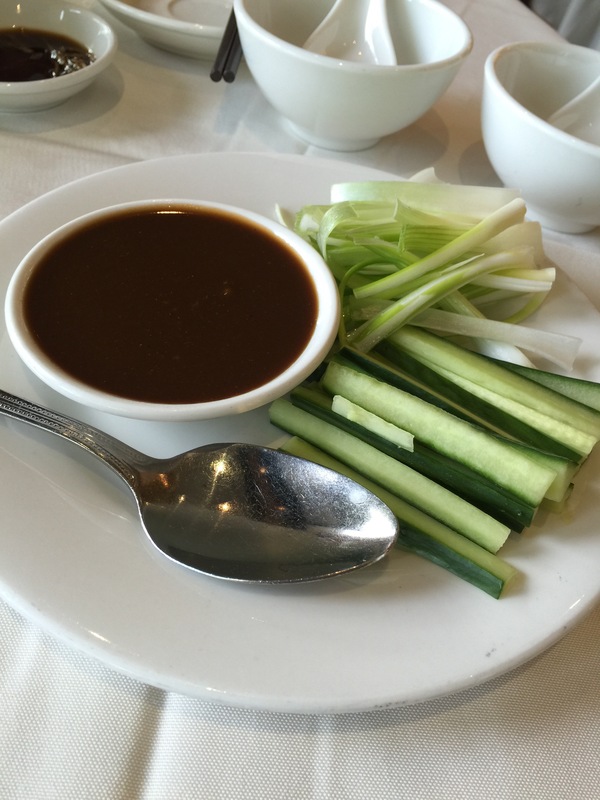 Shanghai River Restaurant is a popular and large family run Chinese restaurant in Richmond. As its name would indicate, it specialize in cuisine from Shanghai, as well as xiao long bao, which was the main attraction for myself and my husband. Luckily, when we arrived at the restaurant on Sunday afternoon, it was early enough in the evening, just after the restaurant opened, that we were able to get a table. As the evening wore on, the restaurant got busy and every single table in this large restaurant seemed to be occupied, especially by large family parties. The restaurant is open and bright and modern, and features a display wall with a glass window that looks into the xiao long bao making operation. 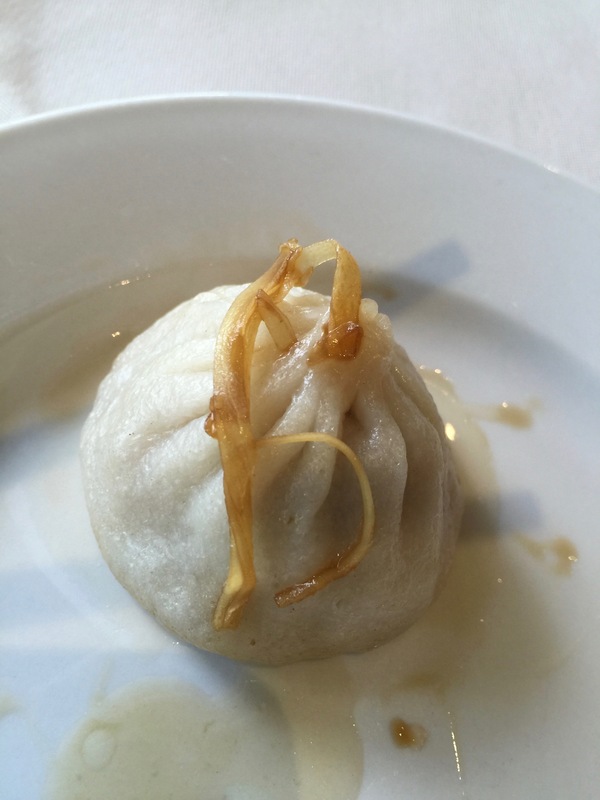 Xiao long bao are steamed soup dumplings that are extremely popular. While you’re dining, you can watch the cooks roll out the dumplings, stuff them, and prepare them to be steamed in wire baskets before their brought steaming hot to your table. 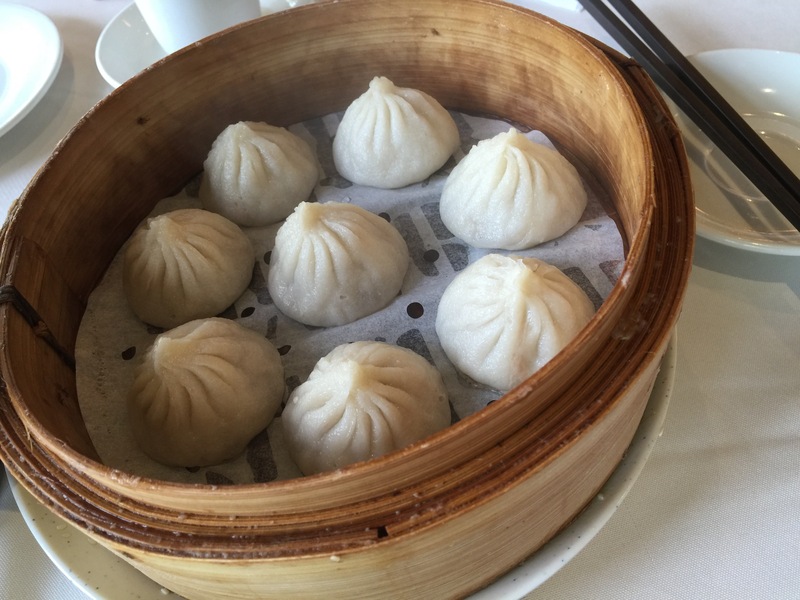 As I mentioned, one of the main reasons we wanted to dine at Shanghai River Restaurant was the xiao long bao, or the steamed pork soup dumplings. Ever since we tried our very first soup dumplings, both my husband and I have been in love with the soup dumpling. A regular pork dumpling, I completely understand it. But a soup dumpling where the dumpling is filled with both a ground pork mixture and soup broth blows my mind. Each dumpling is hand made and placed into this bamboo basket. Once ordered, its steamed and when ready is brought to the table piping hot. You’re warned to be careful when you eat a dumpling as the broth inside can burn the inside of your month. Served with the dumplings we received a soy sauce and fresh ginger dipping sauce. Most people would be satisfied with one order of pork soup dumplings, not my husband and I though, we ordered 2 orders of 8 pieces each and we gobbled it up like we hadn’t had anything else to eat all day. The pork soup dumplings were absolutely delicious. Created to just the right size, each dumpling is bite-sized, so you just pop it in your mouth and let the flavor explode. The dumpling itself has just the right amount of elasticity, but is thin enough that you’re not just trying to chew through a mouth full of dough. The ground pork mixture inside the xiao long bao was quite flavorful and juicy as well. It’s no wonder that they can churn out these little dumplings by the dozens, they have to in order to keep up with the demand for them. My husband and I loved them so much. We didn’t want to order rice or a rice-based dish that would fill us up too quickly, so we opted to order a noodle dish instead. 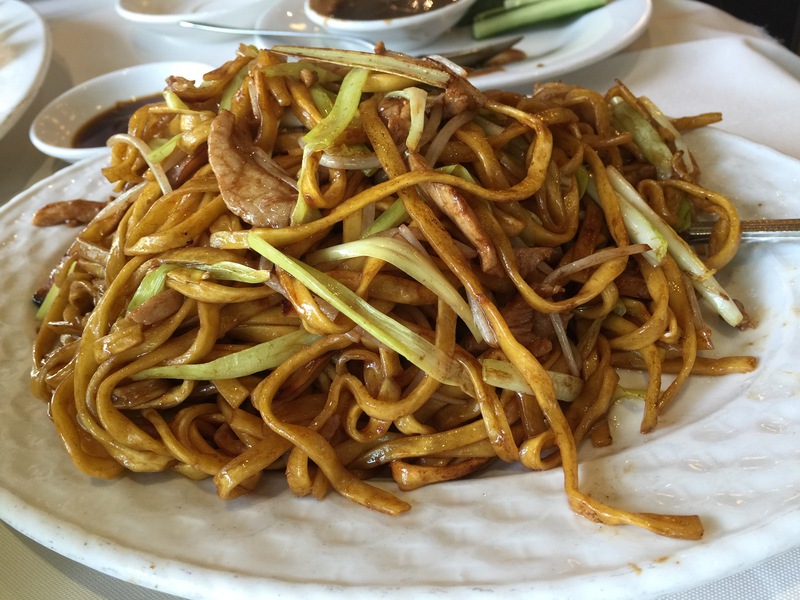 My husband left it up to me to find a dish and order it, so I saw something in the menu called “pan fried homemade noodle with pork.” Pan fried noodles sounded exactly like the kind of dish I was looking for, something flavorful and light. Being that the noodles were homemade noodles sounded even more intriguing as my husband and I have always been a fan of homemade pasta at Italian restaurants, so we hoped that homemade noodles at a Chinese restaurant would be just as spectacular. We weren’t disappointed in the least. These pan fried noodles were pretty simple being stir fried with just green onions and pork and some soy sauce. It’s amazing how simple ingredients can create such a fantastic dish. The homemade noodles were long and thin and flat and were out of this world. They were perfectly prepared and absorbed all the amazing flavors of the stir fry. The pork was a great protein option and the green onions added a bit of crunch plus a subtle onion flavor. This was a much larger dish than I expected it to be too, but it was so good that my husband and I devoured it. My husband even admitted that this dish was much better than he had expected it to be when he told me that I could choose a noodle dish and order it. After having had the soup dumplings and now the homemade noodles, it’s obvious that Shanghai River Restaurant specializes in making homemade dough from scratch to perfection. The other thing that my husband really wanted to order was Peking duck. He’s a huge duck fan, and tries to order duck at every chance he gets. 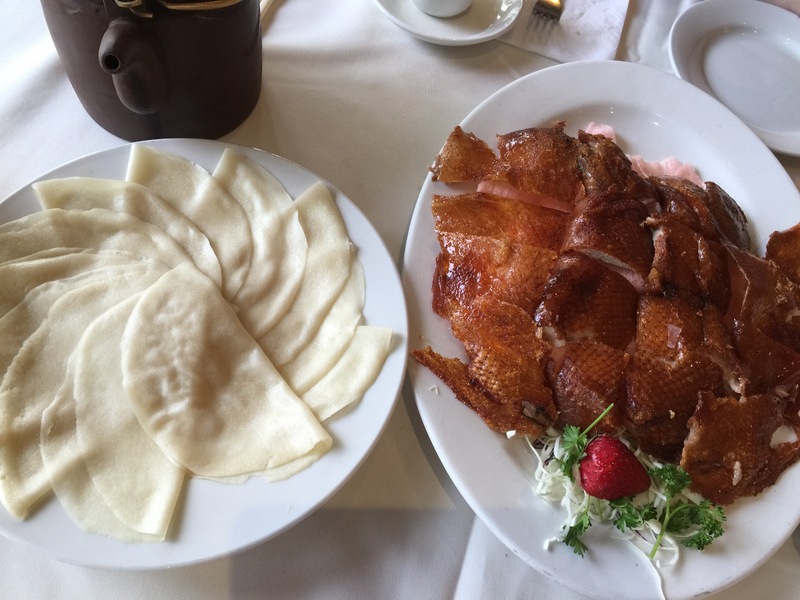 On the menu, Shanghai River Restaurant offered Peking duck 2 ways, so we decided to give that a try. The first way you get duck is traditional Peking duck style where the skin is deep fried separate from the meat. The duck meat is roasted and everything is cut up into small pieces. The skin ends up incredibly crispy and crunchy and the meat is tender and juicy. Served along side Chinese pancakes, a soy dipping sauce, cucumbers and green onions you basically are supposed to take the ingredients and create a duck sandwich or roll. In our case, our Chinese pancake was basically a small crepe-like pancake which is steamed and folded and served to the table warm. You open up the pancake, load in a piece or two of duck, with the skin, take a spoonful of sauce, a spear of cucumber and a bit of green onion, then you fold over the crepe to make a spring roll-like roll and you enjoy the Peking duck. First off, the duck itself was tasty and delicious. I’m not as big of a fan of duck as my husband, but even I could appreciate how delicious this Peking duck was. The duck skin was perfectly crispy and crunchy and perfectly prepared. The duck meat itself was very tender, very moist and full of flavor. Making the whole concoction into a duck roll was terrific, the green onion and cucumber help to cut through the fattiness of the duck meat and the duck skin. The soy dipping sauce adds a bit of sweetness to the roll and the veggies add a fresh element to balance the flavors that are all contained within this thin Chinese pancake. While the dish was huge, my husband and I loved the flavors so much we couldn’t stop making rolls and next thing you know, we actually finished the dish. It’s dishes like this that reinforce to my husband why he loves duck so much. As I said, the menu said Peking duck 2 ways. It turns out that the 2nd duck dish, you can actually choose how you want it prepared. We were given several different options for the duck preparation, which included a soup option. But ultimately, my husband and I chose something a little different and unexpected, lettuce wraps. Not traditionally a Chinese meal item, we were so surprised when presented with this option, and it was so different and creative and unique that we decided to try the lettuce wraps. 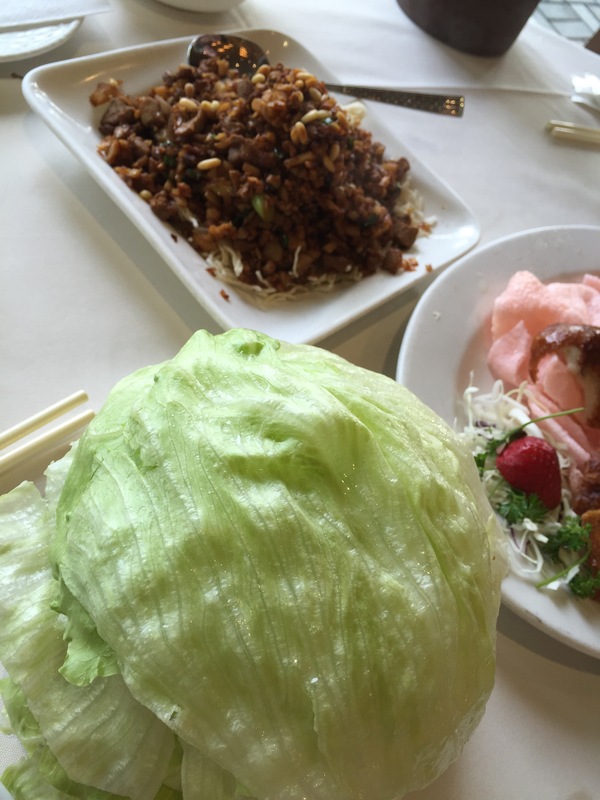 Presented along with a whole plate piled high with crispy, fresh, iceberg lettuce leaves for us to wrap up our duck filling in, a second plate was piled high with stir fried duck meat. 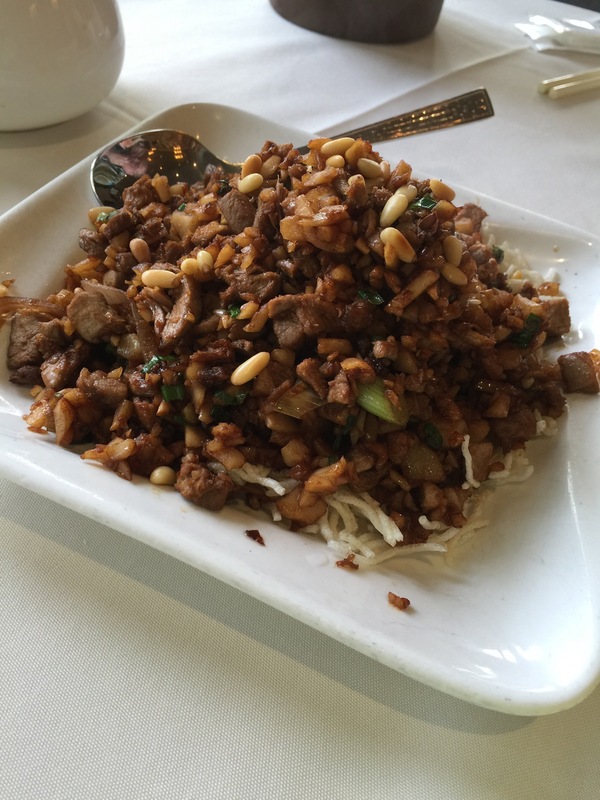 The duck meat filling was made with dark duck meat, onions, green onions, water chestnuts and pine nuts all sautéed with soy sauce and other spices and poured out atop a bed of crispy noodles. Each ingredient added flavor and texture to the duck meat filling; a little sweetness, a little saltiness and to of crunch. Add spoonfuls of the filling into a lettuce leaf and roll it all up to make a really filling and awesome lettuce wrap. The duck meat was, again tender and incredibly flavorful. As mentioned, I’m not the duck fan that my husband is, but these two duck dishes that we were presented with at Shanghai River Restaurant were enough to change my mind on just how good duck can be when prepared the right way. Since coming home from our trip to Vancouver, my husband has talked about Shanghai River Restaurant a couple of times, not only because of the Peking duck dishes we ordered but also for the xiao long bao. 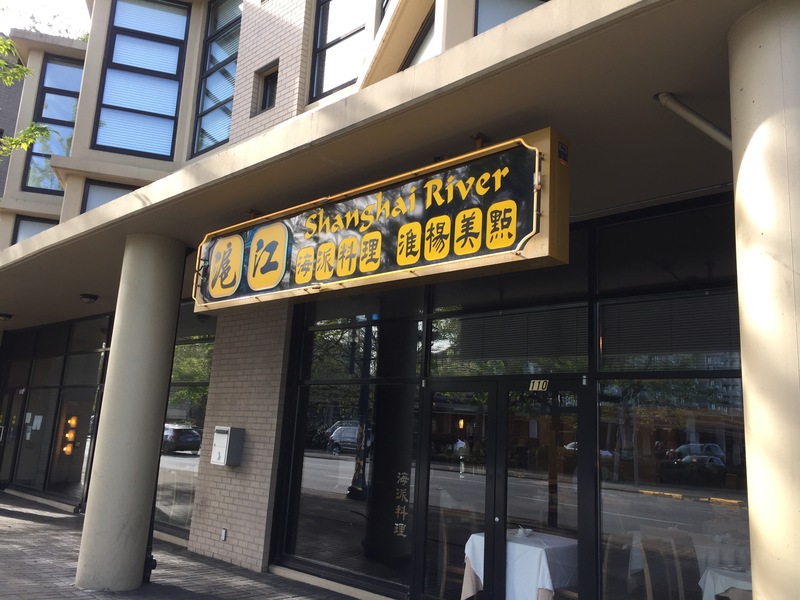 By dining at Shanghai River Restuarant, we felt like we were getting an authentic Chinese/Shanghai dining experience. The food was second to none in preparation and taste. And the fact that they churned out these wonderful dishes in record time was terrific. 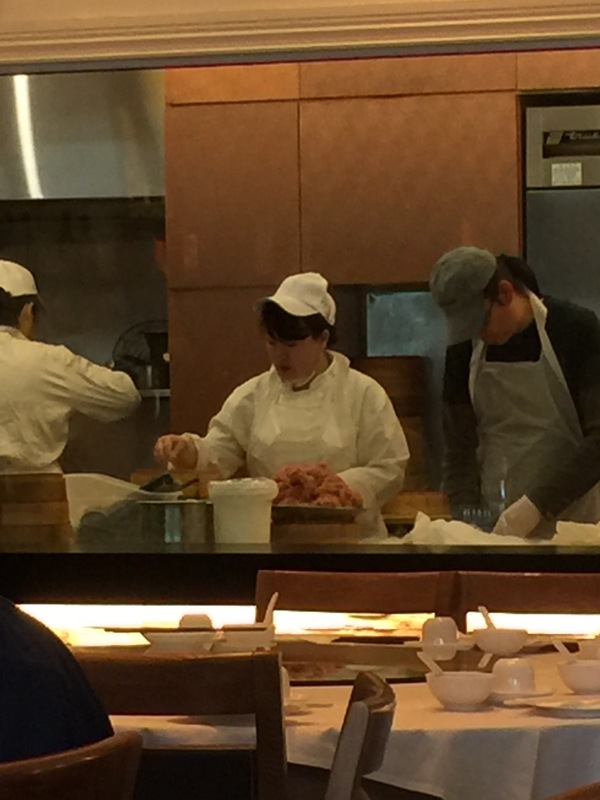 Being able to watch the chefs prepare the xiao long bao that we were dining on just added to the entertainment factor of the restaurant. This was a terrific dining experience to end our trip to Vancouver with, Chinese food that just can’t be beat.